Insane Championship Wrestling (ICW) has announced a huge Women’s Championship match for their Square Go! event. 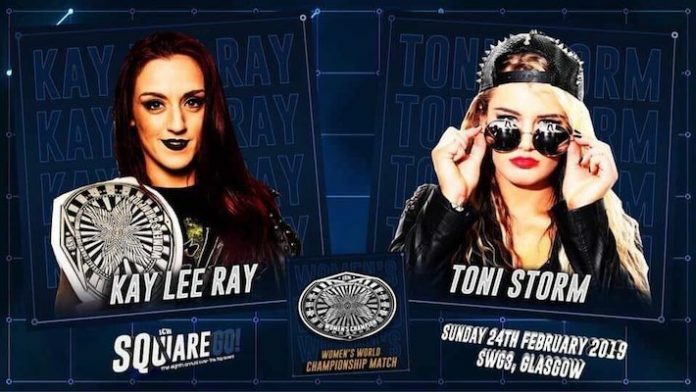 ICW Women’s Champion Kay Lee Ray will be defending against NXT UK’s Toni Storm. Kay Lee Ray was the first ever WoS/World of Sport Women’s Champion and appeared to be staying with the company for the long haul. KLR shockingly appeared at NXT UK’s Takeover: Blackpool event last month and this caused many to question the future of the ITV reboot. It appears as though Kay Lee Ray is heading to the NXT UK brand. Interestingly, Toni Storm is of course the NXT UK Women’s Champion, having defeated Rhea Ripley at the aforementioned Takeover event. ICW has long been associated with WWE, with the company being supposedly ‘greenlit’ for NXT UK Superstars to perform. Storm is one of the biggest stars in the NXT UK brand, having won the second ever Mae Young Classic. Kay Lee Ray is also one of the top female talents in the UK/European scene, so this is somewhat of a dream bout. The NXT UK contract changes were seemingly brought into effect on January 1st of this year. One of the biggest changes was that NXT UK talents could only face other NXT UK talents on independent cards. With Kay Lee Ray now signing with NXT UK this match was good to go.